Western Digital has resubmitted its bid for Toshiba's flagship flash memory unit amid a battle over the sale of the business. The new offer is understood to be in the region of 2tn yen (£14bn). Toshiba needs to sell the unit after an accounting scandal and cost overruns at its Westinghouse nuclear unit. Western Digital, which jointly runs Toshiba's main semiconductor plant, has been feuding bitterly with its Japanese partner. It has sought a US court injunction to prevent any deal that does not have its consent. But Toshiba wants to sell to a different bidder. 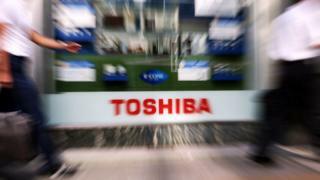 The Japanese technology giant wants to nail down an agreement to sell to a consortium led by the Japanese government by Wednesday, the day of Toshiba's annual shareholders meeting. The consortium, which includes Bain Capital, has previously offered around 2tn yen. Western Digital has a 49% stake in the unit thanks to its joint venture with Toshiba, which has been in existence for 17 years. The US company has said the deal grants both parties rights including consent to the disposal of assets. The BBC has seen a letter sent by Western Digital's board to Toshiba in which they warn they "will not consent to a transaction with the proposed consortium" because of concerns over the involvement of South Korean rival SK Hynix, which they fear will try to benefit from the technology at stake. "SK Hynix paid hundreds of millions of dollars to Toshiba just two years ago to settle claims that it misappropriated critical JV technology," the letter said. "SK Hynix's participation in a consortium purchasing Toshiba's interests in the JVs increases the likelihood of technology leakage and harm to the JVs going forward," it added. Toshiba wants to sell the unit quickly to cover billions of dollars in cost overruns at its bankrupt Westinghouse nuclear unit and to dig itself out of negative shareholder equity that could lead to a delisting. Last week, Toshiba warned its losses for 2016 may be greater than it had previously forecast. It predicted a net loss of 995bn yen (£7bn) for the year to March, up from its earlier estimate of 950bn yen. The firm was demoted to the second tier of the Tokyo Exchange after confirming its liabilities outweighed its assets. It also got regulatory approval to delay filing its annual earnings again, this time until 10 August, after a previous deadline extension to 30 June.